I wanted to be more heart rate monitor, less tape recorder. We linger on the flesh. The “we” in that sentence is the journalist, of course. But it’s also you — or the version of “you” that “we” might be writing for. On my last day in Kathmandu, six days after a 7.8 magnitude earthquake shook 7,500* people to death in this small, landlocked country, I decided to return to the waters of the Bhagwati. This river slows to a trickle as it passes one of the country’s treasures, the Pashupatinath Temple. 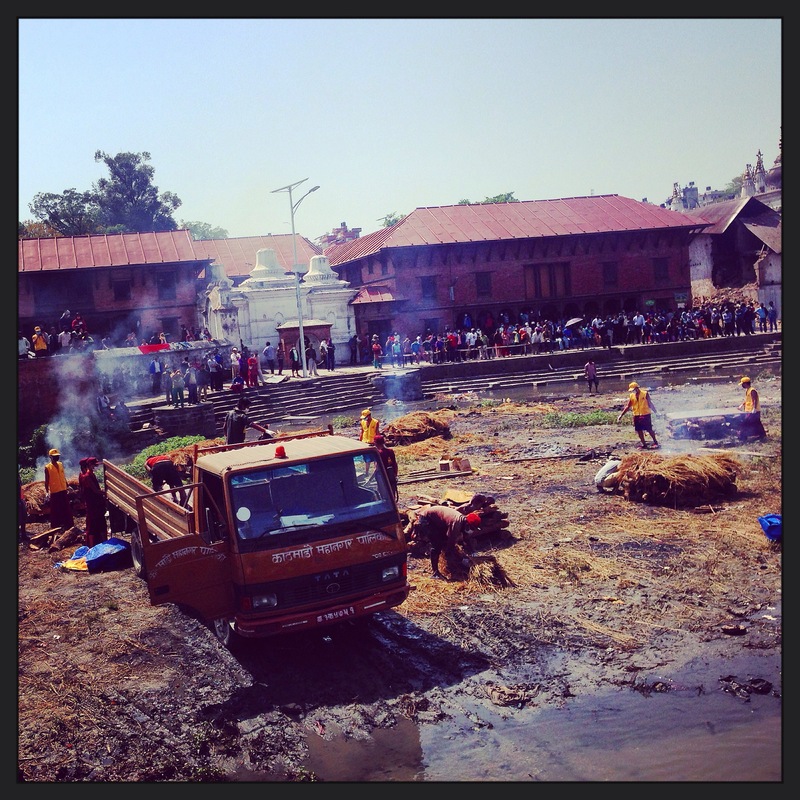 I had been here before — my first day in Nepal — and had stood watching grieving family members cremate loved ones. Flecks of ash, particles of the once-living, floated across the warm winds, catching in the fine hairs of my arm. Acrid smoke stung the back of my dry throat. Looking back, my notebook seems chaotic. The words are mere triggers for observations, fragments of sights each straining to fit a story I might tell. They [the men tasked with cremating] drop the fire into the mouth first. Arriving in the hangover of a natural disaster encourages this kind of struggling. There is a searching for sense amid signals too broad and significant. The stories one longs to find, to record and mark as their own, seem instead to linger, trapped somewhere just beyond touch. So I was there, my final afternoon, at the river. My sleepless body wired to failure on caffeine, the sun’s scratching heat on my bare neck. I just wanted to sit. I wanted to feel still in a place made nervous by sudden movement. I wanted to understand, through mere presence, what grievous loss might feel like. Some say death is supposed to tell us something about this life. That, perhaps, these stories of the living are only complete when coupled with stories of the lost. To avoid this would be like trying to trace a circle with only half the ink you need. But I worry. I worry that true artifice lives in a misheld belief: that we might understand tragedy through broad and ill-timed questions asked of the agrieved. We forget that questions are always easier. They are the hard-shelled armor we shelter behind. Questions are what make our world stop shaking. Not theirs. I tried to remember this. But my eyes drifted downstream to the scurried activity, the cooing of an amassing crowd, and the shimmer of light as it reflected off strange, new, naked bodies. I bled news from this flesh.